Police resort to breaking and entering! With almost a third of burglaries conducted via unlocked doors and windows, police forces are keen to get the message home and encourage people to lock up. However, it seems that one force has crossed the line and engaged in a bit of breaking and entering themselves to get the point across! 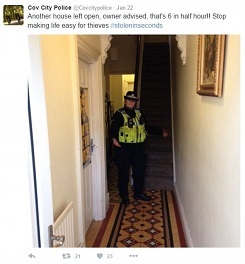 Coventry police decided to demonstrate the number of homes left unsecured by trying doors and letting themselves in. They then posted photos of themselves inside the properties on Twitter with the hashtag #stoleninseconds. While their intentions may have been honourable, they faced a considerable backlash on social media with people pointing out that they had no right to enter homes without a warrant or belief that someone may be in danger, that it was an invasion of privacy and that it was irresponsible to publish photos of unsecured homes on social media where they could potentially be identified. See the story here. So, what do you think? A justified action to get the point across or a badly misjudged strategy?